Production : MD Project Ltd. The movie «Rerberg and Tarkovsky. The Reverse Side of «Stalker» is part of the documentary sequence «Rerberg», which tells the dramatic story of life and work of one of the most striking national cameraman, People’s Artist of the Russian Federation Georgi Ivanovich Rerberg. In the first 10 years of his work in cinema he shot his best movies: «The First Teacher», «The Story of Asia Kliachina», «The Nobility Nest» with the director Andrei Mikhalkov-Konchalovsky and also «Mirror» with Andrei Tarkovsky, without whom it is impossible to imagine the story of world cinema. Rerberg the cameraman was the last in the family of Russian painters, architects and musicians Rerbergs, whose destinies throughout different generations reflected the crisis of human relations in a totalitarian state. This crisis had an especially striking and devastating effect on G.Rerberg himself, when during the shooting of «Stalker» the director Andrei Tarkovsky provoked a «spiritual Chernobyl» against him and other members of the crew. Rerberg’s death severed the link to the true story of the creation of «Stalker», the story which became a legend and concerning which he never made any public statements, although certain existing versions of these events affected his honor, dignity, professionalism and seriously influenced his career. This is a private story, reflecting the future catastrophe of our society. It could become a warning to people, but the documentary facts have been collected only now in this movie. Georgi RERBERG, Andrei TARKOVSKY, Alexei LOSEV, Evgeni MRAVINSKY, Sven NYKVIST (Sweden) and Larisa TARKOVSKAYA. For many years, the story of how “Stalker” came into being remained a blank page in the history of Russian cinema. Only one side of the story had been voiced – Andrei Tarkovsky’s side. In his diaries published outside Russia after his death he blamed his friends and colleagues for the mishaps that took place during the shooting of “Stalker”. 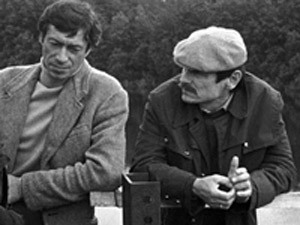 The film “Rerberg and Tarkovsky. The Reverse Side of “Stalker” gives everyone he blamed a chance to tell their side of the story. In the end, it turns out everything isn’t as simple as it seemed according to Tarkovsky’s diaries. A true human tragedy took place on the shooting set of “Stalker”. The film ruined the future of some who took part in creating it, and cut short the lives of others. Andrei Tarkovsky wrote that he considers “Stalker” his best film. He began shooting it with director of photography Georgi Rerberg, whom he had worked with on his previous film, “The Mirror”. IMAGO, the European Federation of Cinematographers, has placed “The Mirror” on its list of 100 finest European films in terms of pictures, noting that the film introduced a new kind of images for Tarkovsky, which became characteristic of his later films, including “Stalker”. The original footage of the first version of “Stalker” shot by Georgi Rerberg perished in a fire. The originals burn up in Russia, but honor, dignity and spiritual nobility do not burn. This is not a scandalous, but rather a tragic story for everyone who was involved in it. After watching “Rerberg and Tarkovsky. The Reverse Side of “Stalker”, film critics noted: “It’s surprising that both Tarkovsky and Rerberg have passed away some time ago, yet the emotional gravity invoked by the mere mention of their names is as strong as ever”. The detective story of “Rerberg and Tarkovsky. The Reverce Side of “Stalker” is based on previously unknown factual material discovered during the making of the film, so the viewer will be in for many surprises. However, the real point of the film is not to uncover the story of dramatic conflict which took place between Georgi Rerberg and Andrei Tarkovsky, but to call the viewer’s attention to a great “passed personalities” of Andrei Tarkovsky, Georgi Rerberg, Victor Astafiev, Pavel Lebeshev, Sven Nykvist… A great illustration of the “time collapse” of the film is the images shot by Rerberg of the last philosopher of the “silver age” Alexei Losev, great conductor Evgeni Mravinski, famous musician Mstislav Rostropovich. The cinema novels from the film “Rerberg and Tarkovsky. The Reverse Side of Stalker” are a part of the film “Rerberg”, which tells the story of the artistic journey and dramatic fate of one of the brightest Russian directors of photography, people’s artist of Russia Georgi Rerberg. During the course of his first 10 years of work in the cinema, he shot his wonderful films entitled “The First Teacher”, “The Story of Asia Klyachina”, “The Nobles’ Nest” – with film director Andrei Konchalovsky, and “The Mirror” with film director Andrei Tarkovsky, without whom it is impossible to imagine the history of the world cinema. Director of photography Rerberg was the last in a dynasty of Russian painters, architects and musicians, every generation of which reflected the crisis of human relations in a totalitarian society. This crisis came down especially hard on Georgi Rerberg himself during the filming of Tarkovsky’s “Stalker”.